Both the 2nd round four-day matches of Bangladesh Cricket League (BCL) ended in draw on the 4th and final day at two separate venues across the country on Saturday. Walton Central Zone played to a draw with BCB North Zone at the Shaheed Chandu Stadium in Bagura while Prime Bank South Zone settled for a draw with Islami Bank East Zone at the Shaheed Kamruzzaman Stadium in Rajshahi. After the 2nd round matches, Walton Central Zone maintained their top slot in the four-team league securing 13.32 points, followed by BCB North Zone with 7.99 points, Islam Bank East Zone with 7.94 points and Prime Bank South Zone with 4.39 points. At the Shaheed Kamruzzaman Stadium in Rajshahi, Prime Bank South Zone resumed the 2nd innings against Islami Bank East Zone with overnight 135 for no loss and finally scored 377 for 5 in 115 overs when the bails were for the 4th and final day (Saturday). Earlier, Prime Bank South Zone scored 258 for all in 81.1 overs in the first innings replying to BCB East Zone's mammoth first innings total of 473 all out featuring two tons by Shamsur Rahman (153) and Yasir Ali (112). Later, Shamsur Rahman was adjudged man of the match. In the South Zone's 2nd innings, national opener Anamul Haque, who was in batting with 46 runs, hammered an entertaining innings of 133 runs off 253 balls, featuring 15 fours and one six. Another overnight batsman Shahriar Nafees failed to add any run to his previous 81 runs off 134 balls, hitting 12 fours, two down Tushar Imran (41), Mahedy Hasan (not out 37), middle order batsman Raqibul Hasan (not out 28), Fazle Mahmud (22) and Nurul Hasan (10) were the other notable batsmen reaching the double figures. All-rounder Afif Hossain and spinner Enamul Haque Junior picked up two wickets each conceding 83 and 105 runs respectively. 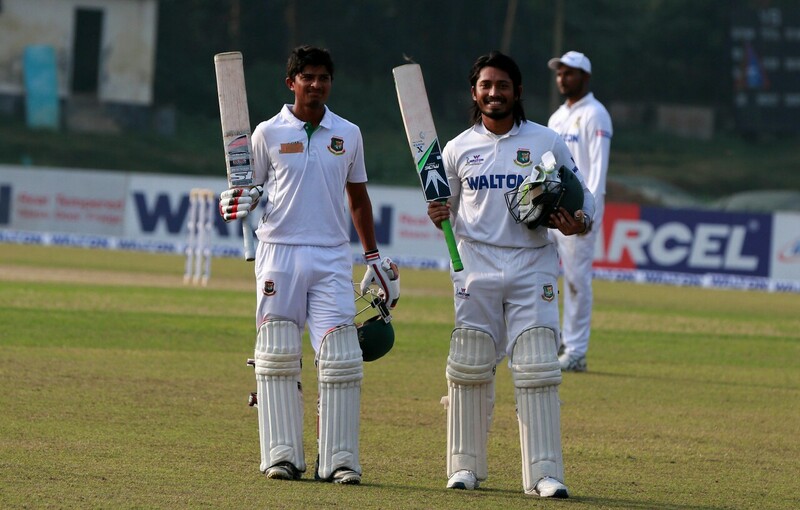 In the day's another league match at the Shaheed Chandu Stadium, BCB North Zone, having 255 runs in the first innings, resumed the 2nd innings in the morning with overnight score of seven runs for one wicket and scored 255 runs for 9 in 89.4 overs at the end of the 4th and final day to settle for a draw. Earlier, Walton Central Zone scored 220 runs in the first innings and made 318 runs in the 2nd innings. One down Sunzamul Islam hammered a polished 92 runs off just 227 deliveries hitting 10 fours in the day's 2nd innings for BCB North Zone. Besides, captain Jahurul Islam with 52 runs, two down Farhad Hossain added 47 runs, all-rounder Sabbir Rahman not out 26 and Dhiman Ghosh 17 runs for the North Zone. Abu Hider Rony made the major damage to the North Zone innings grabbing six wickets for 86 runs while Robiul Hossain took three for 54 runs. Ebadat Hossain of North Zone, who claimed six wickets for 51 runs in the first innings, was adjudged the man of the match.